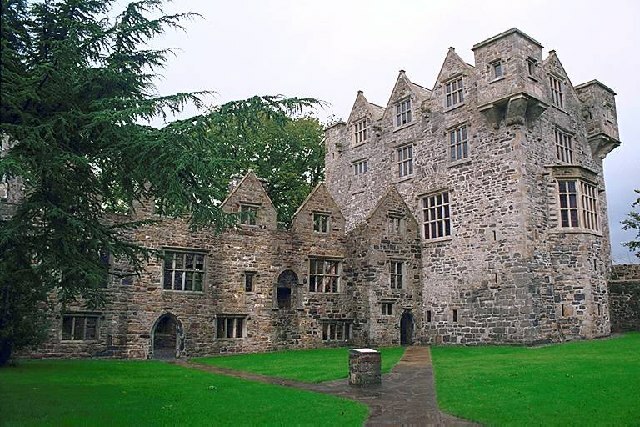 Notes: Donegal Castle is a castle situated in the centre of Donegal town, County Donegal in the northwest of Ireland. For most of the last two centuries, the majority of the buildings lay in ruins but the castle was almost fully restored in the late 1990s. The castle consists of a 15th-century rectangular keep with a later Jacobean style wing. The complex is sited on a bend in the River Eske, near the mouth of Donegal Bay, and is surrounded by a 17th-century boundary wall. There is a small gatehouse at its entrance mirroring the design of the keep. Most of the stonework was constructed from locally sourced limestone with some sandstone. The castle was the stronghold of the O'Donnell clan, Lords of Tír Conaill and one of the most powerful Gaelic families in Ireland from the 5th to the 16th centuries. Recently the Office of Public Works has renovated the castle. The keep has had new roofing and flooring added, in keeping with the original styles and techniques used in the 15th and 17th centuries. The stonework has been restored and the manor wing has been partially roofed. The oak timbers used came from the Brookeborough Estate in County Fermanagh. The castle is now open to the public and often hosts events such as Gaelic cultural evenings.